Love 'em or hate 'em, Goldman Sachs (GS) is widely followed on Wall Street, so when they talk, people (at minimum) pay attention. About 6 weeks ago Goldman turned bearish near term on their recommended basket of commodities [Apr 12, 2011: Goldman Sachs Turns Near Term Bearish on Their Recommended Basket of Commodities] Three weeks later, the implosion of the commodity market began, as margin requirement hikes in silver led the way for the broader group. That's pretty darn good timing, considering the group had been in a bull market of incredible strength since late August 2010. This morning, Goldman is getting back on the bullish bandwagon. This is pushing up commodities in the premarket as lemming pile in. We'll see if Goldman can go 2 for 2 on these calls in the next few months. Although we remain structurally bullish and have long argued the structural case for being long, timing does remain critical. 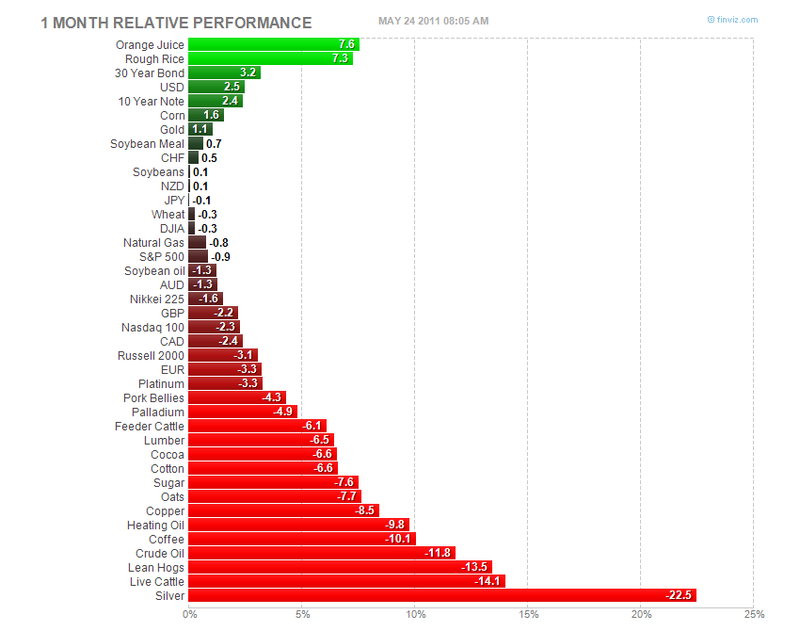 This was evident in the recent market correction, which brought commodities down roughly 10% from their April highs. With prices now more in line with near-term fundamentals and price targets, we believe that the risk/reward once again favours being long commodities. Although the economy has likely shifted into a slower, but sustained, growth environment, we continue to expect that economic growth will likely be sufficient to tighten key supplyconstrained markets in 2H2011, leading to higher prices from current levels. We expect that the ongoing loss of Libyan crude oil production and disappointing Non-OPEC production will continue to tighten the oil market to critical levels in early 2012, with rising industry cost pressures likely to be felt this year. We are now embedding in our forecasts that Libyan production losses will lead to the effective exhaustion of OPEC spare capacity by early 2012. This raises our year-end Brent crude oil price forecast to $120/bbl from $105/bbl, our 12-month forecast to $130/bbl from $107/bbl and our end-2012 forecast to $140/bbl from $120/bbl. While a sharp decline in world economic growth remains a downside risk to commodity prices, we see the current slowdown in economic growth as part of a normal mid-cycle pause, partially driven by higher commodity prices, and therefore not a reason to expect commodity prices to decline substantially. Further, we believe that the recent evidence of economic weakness represents signs of a slowdown and not a downturn, which is reinforced by signs that Chinese metal demand has already returned with the SHFE-LME copper arb opening again, exchange inventories declining and the Shanghai copper forward curve moving into backwardation.